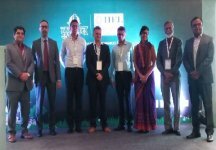 Leading home finance company in India, IIFL Home Finance Ltd. organized ‘KUTUMB - Chapter II’, a platform to promote benefits of green affordable housing and sustainable living at Indore, Madhya Pradesh. After the grand success of ‘KUTUMB - Chapter I’ in Ahmadabad, it was time for leading industry professionals to come together once again at the second edition of ‘KUTUMB’ at Indore Marriott Hotel where the mega event took place in association with National Housing Bank (NHB), International Finance Corporation (IFC), Green Business Certification Inc. (GBCI), CDC UK, and Ashok B Lall Architects. “KUTUMB - Chapter II is an extension of social and environmental initiatives taken by our company such as Affordable Housing Loans, Swachh Bharat, and Women Education & Empowerment. To further push these, we look forward to having more editions of KUTUMB across cities in India,” said Mr. Monu Ratra.